It started with a commissioned work for The Museum of Ethnography in Stockholm in 2014. I was asked to create a work that could interpret the ways in which museums represent or evoke different worlds. 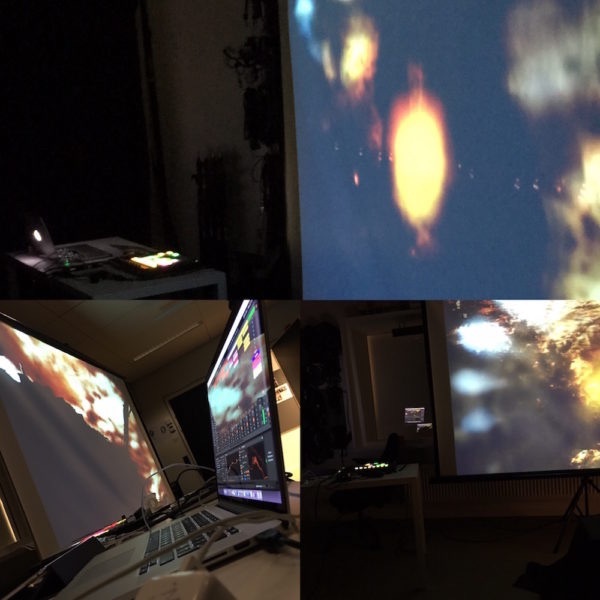 It became a performance based on live mixed video and sound/electronic music that premiered in November 2014. Since then, Possible Worlds has been performed in different venues. I also use it in my research about museums, cultural heritage and worldmaking. Possible Worlds is an ongoing experiment in worldmaking and rendition. Its’ mainpart is a live mixed audiovisual performance, that is organised for selected audiences. The performance is based on surreal juxtapositions and layerings of sound and images collected on field trips to various sites in different parts of the world. In the first iteration of the performance this material was combined with sounds and images from the archives and collections at The Museum of Ethnography in Stockholm. The result was an attempt to explore notions of ethnographic surrealism. As new iterations of the work are performed, new material is added and included in the worldmaking-sessions. Central for the work is the mix of sound and video that is juxtaposed with material objects and props related to the show. I used Possible Worlds as Point of departure for another art project, called In Praise of Other Places (read more about that project on its’ dedicated page). In November 2016 I used Possible Worlds as part of a module in the master-programme course “Strategies for Composing Cultural Analysis” as part of MACA at Lund University. This became a good opportunity to mix art, reserach and education. I plan to perform Possible Worlds in other spaces and for new audiences as part of my ongoing experimentation. Any suggestions and proposals are welcome. I've published some texts about Possible Worlds . 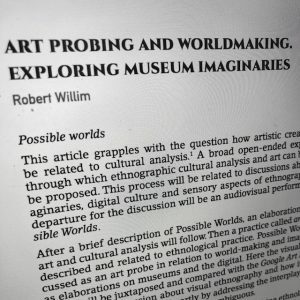 The article "Art Probing and Worldmaking" deals with the work in relation to museums, cultural analysis and visual ethnography.